As the night approached in Ojai, we new that a girls night wouldn’t be complete without margaritas and Mexican food…olé! My friend Angela told us about this place called Agave Maria’s and promised their margi’s wouldn’t disappoint. She was correct my friend, to say the least. These margaritas weren’t your typical, sweet & sour mix, and be done with it. They weren’t even called margarita’s. They were called “pixie” rita’s!! I quickly learned that a “pixie” rita is made with fresh squeezed pixie tangerine’s grown in Ojai along with the restaurant’s own Azul tequila silver, triple sec and a dash of sweet and sour. Our server informed us that the pitcher we ordered may take a few minutes because they had to squeeze the tangerines. Um, yeah…ok…take your time! I’ll wait all day for that kind of freshness. The first sip was so incredibly refreshing with just a hint of sweetness from the tangerine, but it wasn’t too sweet at all. The bright orange color instantly made me smile and the pitchers kept a comin’. The food did not disappoint either. 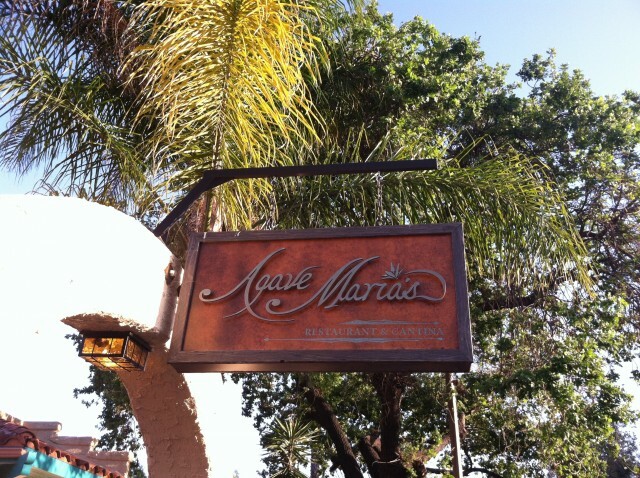 Agave Maria’s serves homemade chips and salsa that you can’t help but take down like a champ. I ordered the chicken tacos and my friends ordered carnitas and grilled shrimp tacos. And the winner was….GRILLED SHRIMP TACOS! Don’t get me wrong, my chicken tacos were great, but there was something about their shrimp. They were seasoned to perfection with a slight kick and SO plump. Next time I go back, I know what I’m ordering. Sadly, I didn’t get a picture because they were devoured too quickly. Ooops! Next time. We laughed, ate, and drank on the beautiful patio until the sun went down. It was a wonderful evening and my love for Ojai continues. I’m SOLD! Food, Pixie Rita’s; shrimp and calm surroundings w/classical guitar ~ I’ll meet you there on May 31st! Hey! I am a fellow food blogger and live in Ojai! We go to Agave Maria’s pretty regularly, mostly for the margaritas! I wish the salsa was better but you can’t beat the patio! Cheers!